An environmental management system (EMS) is a 'tool' that enables an organisation of any size or type to control the effect of its activities, products or services on the natural environment. 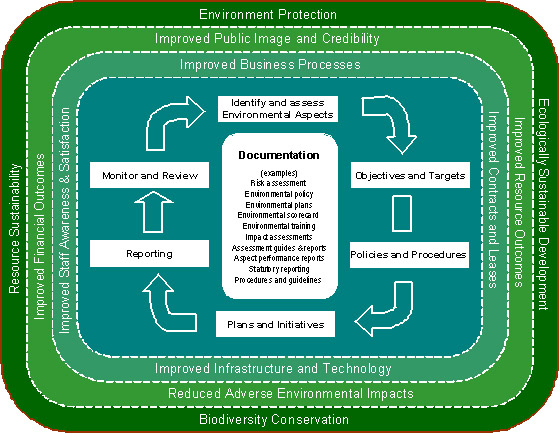 An EMS ultimately supports environment protection, biodiversity conservation, ecologically sustainable development and resource sustainability (Figure 1). The primary element of an EMS is determining which aspects of the business incur environmental impacts. Once identified these components are systematically managed to achieve better control and performance. The EMS management cycle can be thought of as a ‘Plan, Do, Check, Act’ process of continuous improvement, aimed at improving business and environmental performance.